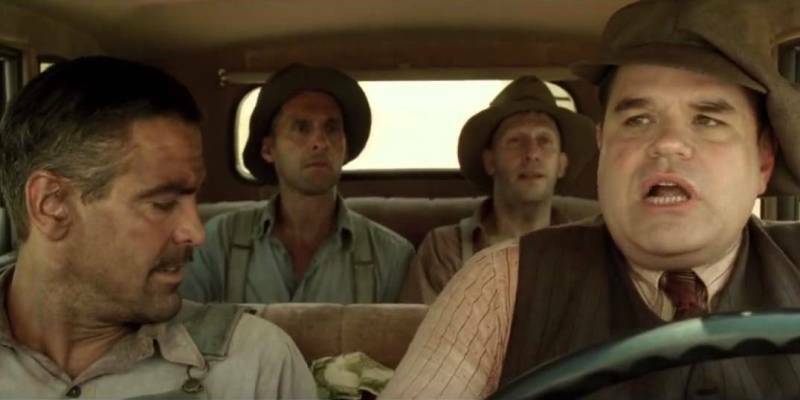 Everett, Pete and Delmar (George Clooney, John Turturro and Tim Blake Nelson) have just escaped from a chain gang in 1930s Mississippi, with the intention of recovering the loot from the burglary that resulted in Everett’s incarceration, before the area within which it is hidden becomes flooded in a few days time. The three men – at least two of whom are amongst the stupidest creations the Coen brothers have ever concocted, which is saying a great deal – have a long way to go and a short time to get there, and their journey isn’t made any easier by the lawmen on their tails and the various obstacles that must be overcome, not least of which is coping with each other’s company. I’m not overly familiar with much Ancient Greek literature. I don’t know many people who are, or at least not many who bring it up in conversation all that often, but elements of Homer’s Odyssey have crept enough into popular culture for the rambling, episodic, downright fantastical elements of this story to not seem overly alien. Here, though, some of those less realistic characters – the giant cyclops, the mermaid-like sirens – have been redrawn in a more believable way. Yes, there’s still a huge, violent being with one eye, but he’s played by John Goodman with an eye patch, and the three nymph-like aquatic seductresses are nubile young women, bathing in a lake, which makes this a much easier film to get into that I’d imagine a direct adaptation would have been. OK, the movie at hand. As may be already apparent, I’m something of a Coen brothers fan, but it had been a fair few years since I’d last seen this movie, so long in fact that I’d all but forgotten pretty much everything except the soundtrack, which is one I’ve listened to almost more than any other (I think a couple of Tarantino’s are the only ones that beat it. And The Muppets, obviously). The soundtrack is amazing, with The Man of Constant Sorrow being a particular highlight, as indeed is Tim Blake Nelson’s rendition of In The Jailhouse Now, so I heartily recommend it. My only other memory of the film was with regard to the performances, namely how great Clooney is here. He is most assuredly the brains of the operation, although one feels he is more possessing of a large vocabulary than he is of being as adept at planning as he both thinks he is and would need to be in order to see things through to his intended conclusion. Despite being friendly towards the other two, I got the distinct feeling that Everett would have happily left Pete and Delmar behind, had they not all been chained together. And it’s a great thing that they were, because as great as Clooney is at playing a vain, arrogant buffoon, this film would be a darn sight less fun without Turturro and Nelson on idiot duty. Pete and Delmar are the key to this movie and, despite both being idiots, they have very different characters. Pete is very much of the belief that he should be in charge, and is bitter towards Everett for showing more initiative, whereas Delmar is just happy to be there. He’s quite content to be anywhere other than breaking rocks in the hot sun, and is free of any other cares in the world. The kinds of conversations these guys have are so asinine that they could easily become annoying or intolerable, but the level of dialogue and the performances on display prevent that from even getting close to happening. The supporting cast is full of character actors in colourful roles – the aforementioned John Goodman as a duplicitous one-eyed salesman, Charles Durning as local governor Pappy O’Daniel, Michael Badalucco as George “Don’t call him Babyface” Nelson, Holly Hunter as Everett’s ex-wife Penny, Stephen Root as a blind radio station owner – all of whom are perfectly cast in each of their roles, but don’t necessarily outshine the lead trio. On the rare occasion when the story seems to be getting too silly for it’s own good, it’s within that silliness that comedic gold is found (“We …. thought ….. you …… was …… a …… toad.”) and whilst towards the end the final act does begin to drag once Everett gets close to his initial goal, there’s a denouement in the last scene that brings it all home and wraps everything up nicely. Basically, I’ll be posting a ranking of every Coen brothers movie tomorrow (hopefully), and since re-watching this film, it’s been bumped up the order a little bit. This entry was posted in 09/10, 1001, 5-Star 500, Choose Film, Coen Brothers, Film-Makers, French Toast Sunday, Review, The List and tagged Carles Durning, Coen Brothers, George Clooney, Holly Hunter, John Goodman, John Turturro, Michael Badalucco, O Brother Where Art Thou?, Stephen Root, Tim Blake Nelson by jaycluitt. Bookmark the permalink. O Brother is my favorite comedy EVER, by far! So glad you enjoyed it! Living in Mississippi, the film is common viewing around here, which is great, considering most folks in my neck of the woods have a rather elementary filmography. I agree with you on the ending being a bit of a drag, but you expect that with the Coen brothers, unfortunately. Wow, favourite comedy ever! That’s saying something. No idea what mine would be. And yeah, the Coens don’t always know how to come up with some kind of conclusion for their films, but I rarely mind. I laugh hysterically everytime I watch this. It deserves to be moved up in the pecking order of Coen flicks. Great review. Thanks Wendell, it was much better than I remembered. Hard not to love this film. And it’s hard not to respect the Coens for writing a comedy and giving Homer screen credit.